Back-breaking, intensive to cushy or sedentary; our jobs have undergone a sea change in terms of the demand physically and that’s why office exercises have become a hot topic. While we can never recreate the manually intensive jobs now, we can surely keep obese or overweight readings on the scale at bay. Because let’s face it, the more electronically smarter we are getting, the more sedentary our bodies have become. Therefore, if we are looking for a way out of our otherwise not so active work hours, the following office exercises should be your thing! How to lose weight with a desk job? Ask anyone of our Nutrition Coaches for FREE! Just click and voila! The first consultation is on us. 11 Desk Office Exercises so that you Warm-up as you Work! You can take advantage of the few minutes you have between pending deadlines and learn to exercise while you work. 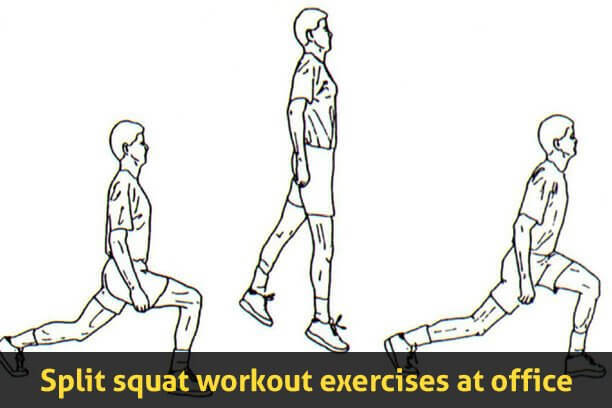 Office exercises are not only simple but effective too. Presenting 11 easy-to-follow office workout exercises which can be done discreetly too. The best way to avoid elevator small talk or status updates is to take the stairs. Be a master of the stairs, plug in earphones and climb up 2 stairs at a time or as you wish in tandem with the music. Worried you may be spotted during this unique workout routine? Don’t, because of the elevators the stairwells are nearly empty. Instead of slogging away for hours nonstop, take a mini-break for a stationary jog. Spot jogging is a great way to get a cardio buzz. Pop up from your chair and jog in place. Are you willing to extend it to huff and puff a little more? Then go up to a corner in the office for an energetic jog. Continue for one minute, return to spreadsheets, and repeat. Happy with a new client acquisition? Thanking God it’s Friday? Or heard good news from a colleague? Well, time to celebrate it a bit different than just with hooting! Celebrate with the split squat jumps, a new way to show happiness and also an office workout routine. With feet hip-width apart, step the left leg back two feet and balance on the ball of the foot. Next, lower into a lunge, and then accelerate upwards in an explosion of celebration. We often miss our workout due to late office hours and cannot enroll in the fitness programs. 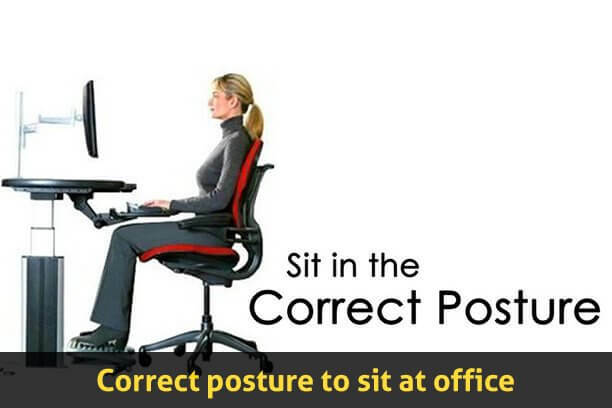 Office exercises are convenient that you can do while sitting in front of your desks. Walking during work is totally underrated. Walking can be a regular part of office exercises. Check up on a co-worker, meet your boss instead of sending that email, welcome a new joint, go up to the pantry for a sip of water. It is time you start being on your feet physically and not just monetarily (which your work helps). Chair exercises for weight loss at the office. Wondering how to burn calories while sitting? Chair squats can be an effective body-strengthening office exercise. Stand tall. Keep back straight. Lower to one inch of a chair, pretending you are sitting down. Hold for ten seconds. Lift back up to standing position. 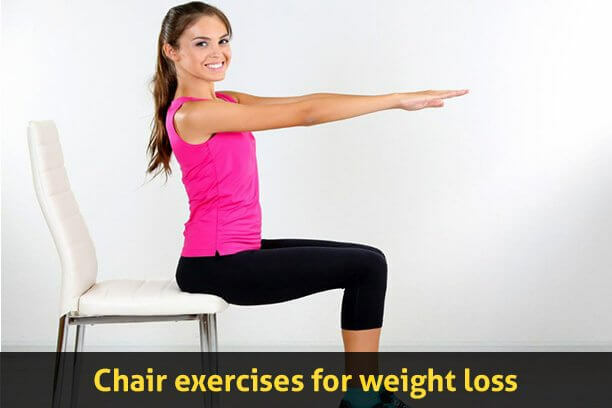 Repeat the chair exercises for better results. The best part is, no one will notice you doing this workout. After all, most of them will be busy working and just sitting. Chair exercises for toned legs at the office. With legs straight, cross one on top of the other. Raise them off the floor. Press top leg down and resist with bottom leg. Do until muscles are tired. Fidgeting can burn an extra 350 calories a day. Rapidly tapping your feet, talking with your hands, and chewing gum, all count. While the calorie burn for each movement is minimal, fidgeting could add up to a loss of up to 36 pounds (16.3 kilograms) a year. So do not strap yourself down and let lose the energy. Good posture is an effective core strengthening measure. It requires you to use muscles to keep your tummy tight and your back straight. Do it continues to build abdominal strength, alleviate lower back pain and help you feel more confident. 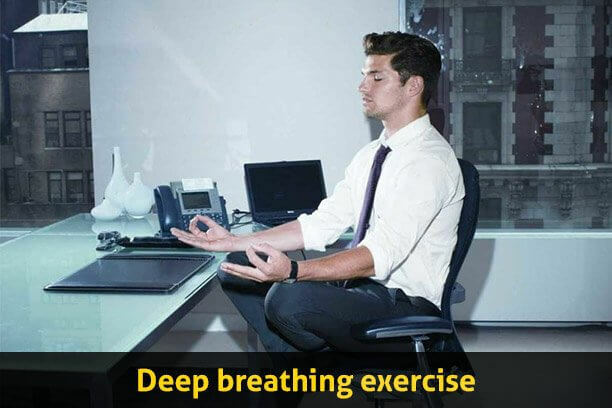 Deep breathing can be perfect office exercise. It helps you relax and lowers heart rate. Breathe in through your nose and out through your mouth. We don’t recommend this office workout routine to be done during meetings with the boss! 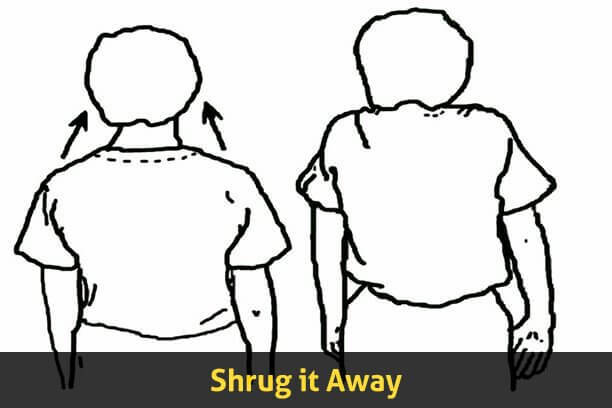 For this office exercise, just raise both your shoulders up to a shrug and hold this position for 5 secs. Repeat this 15 times. You can also combine neck stretches along with this exercise. 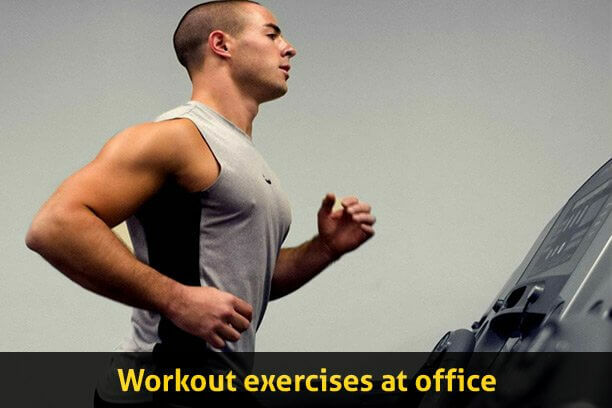 There you go, we have highlighted some easy office workout exercises for you. But we aren’t done, here is another office exercise tip that will come handy. Stand whenever you can. 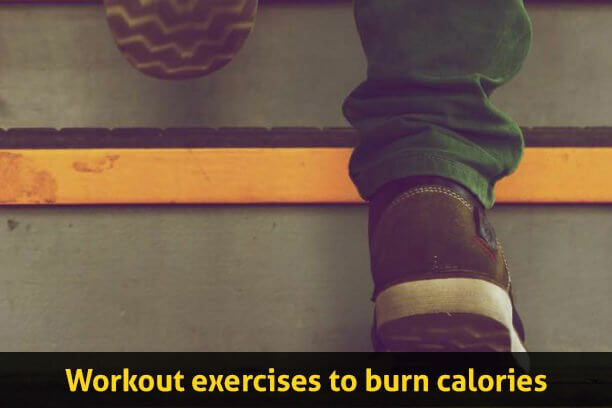 You’ll burn more calories than sitting. Take con calls as you walk or stand. This is what even established nutritionists do to keep fit. By making simple workouts and office exercises part of your everyday work routine, you’ll be healthier, happier and more productive. But let’s keep that our little secret. Research suggests that the recommended 30 minutes of cardio workout routines five times per week may not be enough to erase the effects of a sedentary lifestyle. You will have to supplement it with a healthy diet! Evening snacks at the office are mainly lead your diet to go for a toss. Watch this video to know some of the healthy office snacks that you can stock up.